Here's an artist's impression of a fascinating evolutionary possibility (Creationist dupes stop reading now. You don't want to know about this.) Scientists have taken a fresh look at Microraptor gui, which lived 125 million years ago and appears to have used all four limbs as wings; it had long and asymmetric flight feathers on hands and feet. Initial thoughts were that it glided with all four wings/limbs on the same plane, like a dragonfly or a flying squirrel; but it now seems more likely that it used its legs as a lower pair of wings, as in those old bi-planes flown in World War I. The early bi-plane configuration was needed to gain enough lift to take off and fly. Ditto for nature, it seems. 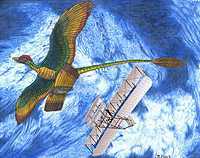 Until the fore limbs became long enough to sustain flight, a bi-plane configuration using feathered legs was needed!